Rona Cran, Collage in Twentieth-Century Art, Literature, and Culture: Joseph Cornell, William Burroughs, Frank O’Hara, and Bob Dylan. Ashgate Publishing 2014. 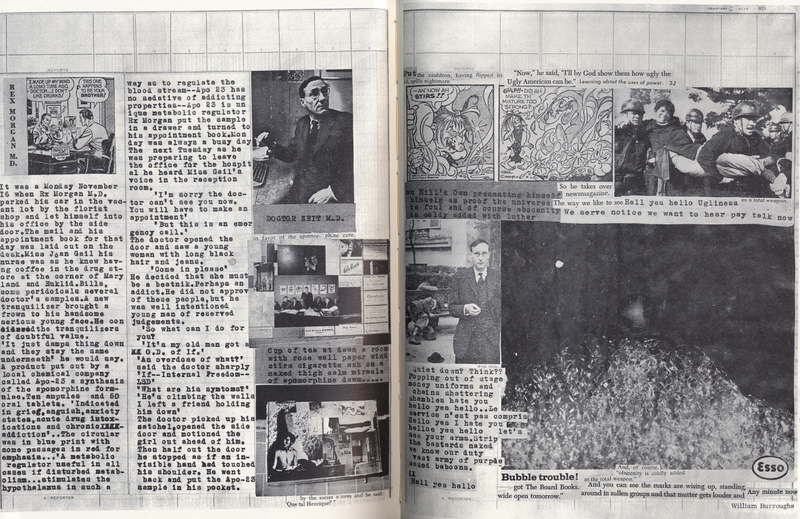 The cast of Rona Cran’s Collage in Twentieth-Century Art, Literature, and Culture: Joseph Cornell, William Burroughs, Frank O’Hara, and Bob Dylan sounds like a motley crew at first glance. At reading the title I instantly wondered whether the mentioned four would have ever engaged in a conversation at a cocktail party held, for example, at William S. Burroughs’ bunker on the Bowery, or would they rather have remained adrift, glass in hand, each one for himself? At least, I am sure that it would have been an interesting sight. The proposed logic with which the author yokes this jumbled constellation together is the mechanism of collage where heterogeneous elements are juxtaposed on a common surface. Max Ernst described this mechanism as “the coupling of two realities, irreconcilable in appearance, upon a plane which apparently does not suit them,” and before him the forefather of the Surrealists Lautréamont summoned the oft-cited image of “a chance encounter of a sewing machine and an umbrella on an operating table.”1 The common ground on which the four artists in Cran’s book are grouped is their use of collage and their, more or less, strong connection to New York. As the title suggests, the book aims to present four different manifestations of collage as one of the most prevalent artistic techniques of the twentieth century. With this unusual quartet, Rona Cran brings together a selection of artists, who, except maybe for Cornell, are not the obvious canonical names one associates with collage. The differences between the four are not only generational but lie also in the different media they worked with. Joseph Cornell was a visual artist and maker of art objects. William S. Burroughs, who called himself “a humble practitioner of the scrivener’s trade” in his last journals, is mainly known as a writer, but his role as an artist who transgressed the borders of genre and medium with his cut-up experiments has become increasingly acknowledged.2 Frank O’Hara was a poet, an art critic, and a curator at the MOMA, who had strong ties to New York’s abstract expressionist painters, but his main medium was the word. Bob Dylan is, as everybody knows, a singer and songwriter, who could be otherwise called a singing poet. The reason why I am repeating briefly the obvious classifications of these four artists is to point to the important issue of terminology. Each of the four worked in a different medium and obviously used different procedures to produce their work, which raises the question whether what they produced can be universally called collage. Burroughs, for example, never denied the affinity of his cut-up experiments to the techniques of the historical avant-gardes, he even emphasized them through references to Tristan Tzara, but he still insisted on using a different term to distinguish his method. To deny the differences of these artworks by simply classifying all of them as collage is wrong in my opinion, and I want to use this review as a soapbox for making a strong case for a different terminology centered around the term montage instead. I am aware that the widespread Anglo-American usage of the term collage, with minor exceptions, is very inclusive and universal, but the discussion of Cran’s book gives me the opportunity to make clear why we should rethink this conception. This ‘conceptual’ and ‘theoretical’ approach to collage might just as well be called ignoring the materiality and process of most composite works of art that allows one to label everything that is remotely fragmented as collage, or as Cran does in the case of Bob Dylan, “collage-esque” (187). This widely accepted and prevailing perception of collage is in no way analytical, but rather very arbitrary. If collage was purely conceptual, we might as well call it free-association. I want to counter Ernst’s statement by insisting that it is the glue that makes the collage. It seems very surprising that the introductory chapter, in which the problems of defining collage are discussed, never once mentions the term montage. This omission is telling in many ways. First of all, it reflects the differences in terminology across nationally formed discourses. Secondly, it is an omission that not only eclipses the ‘absent origin of collage in the physical act of pasting,’ but also the technological and socioeconomic conditions that made these artistic practices possible in the first place. amalgamation as a main characteristic of the Surrealist dream aesthetic. Burroughs’ and Gysin’s cut-up, on the other hand, underlines the analytical and destructive aspect in the production of composite art forms. In sum, one can say that each movement in the theorization of their practices emphasized one certain aspect of the entire montage process that fitted their program. To ignore these emphases through the acceptance of a generic conception of collage hijacked by the Surrealists, means to neglect the material operations involved in the practices and the political agendas that were formulated around them. As for the second aspect, it can be asserted that the figurative use of the term collage, as proposed by the Surrealists, and the universal conception that includes a wide variety of art that goes with it, is misleading insofar as it clouds not only the production process but also the technological and socioeconomic conditions that made these artistic practices possible in the first place. The standardization and serialization of industrial production influenced all branches of artistic production. Photography and new printing techniques at the turn of the 19th and 20th centuries made reproductions of works of art in books and magazines, but also a variety of other images in news publishing and advertising widely available. This richness in cheap, ubiquitously available graphic material as a pool of artistic material was made possible through industrial montage as a technological basis. If we were to use a generic term under which the various artistic techniques of fragmentation and recombination resulting from these possibilities could be subsumed, then the term montage adequately reflects these conditions as a central feature of the second industrial revolution that provided the raw material and the technical means on which the avant-gardes could creatively thrive. The use of the term collage on the other hand clouds and distorts this historical fact and isolates these practices into an assumed autonomous realm of the arts, which supports a heroic conception of the avant-gardes. Having established these terminological and theoretical preliminaries, let us return to Rona Cran’s book and to the question how she frames its narrative. Following the conceptual definition of collage, the author describes her work as a cross-disciplinary study of collage with New York as a common point of reference. According to Cran, no one “has yet attempted a cross-disciplinary study of collage.” (37) This is quite a bold claim considering the vast body of research on intermediality, transmediality, interart, and word and image studies, where collage as a cross-disciplinary practice has been dealt with in numerous publications and exhibitions. One could name for example Marcus Boon’s already mentioned In Praise of Copying (2010), Maud Lavin and Matthew Teitelbaum eds. Montage and Modern Life, 1919-1942 (1992), Kirk Varnedoe High & Low: Modern Art, Popular Culture (1990), to name but a few selected titles that have dealt with this subject. There are also numerous studies on literary collage, which thematize the influence of the visual arts on literary representation. In short, the intention is to show the different forms and effects of collage that originated in the same city. Again, we are faced here with the problem of a universal conception of collage, since the different uses and forms are defined by their respective technique and production process. It can be granted that these aspects are to some degree covered in the first two chapters on Cornell and Burroughs, but it does not become exactly clear how O’Hara and Dylan produced their supposed collages. I am aware that in the cases of both of the latter the process of writing is not as invested in material operations as in Burroughs’ case. O’Hara and Dylan appropriated (mis)quotations, slogans, and bits of conversation, and weaved them into the fabric of their writing, but one could ask whether this is enough to qualify them as collages, but if the definition of the central term is wide enough, anything fragmentary might fit. Even though Cran acknowledges the fortuitous linking of the four artists and calls her book “a self-reflexive exercise, embodying the collage form it discusses” (40), one might wonder in how far such artistic ambitions of the author contribute to a constructive scholarly debate. The second link that is supposed to bind the four case studies together is New York as the capital of the arts after 1945 and as a “city built on intersections and by immigrants.” (10) It is true that New York, and Manhattan with its grid structure can be likened to a collage, but this visual analogy could be made for many American metropolitan cities. Especially relevant in this context is the fact that New York became the artistic capital of the twentieth century after 1945 and Cran depicts very convincingly and knowledgeably how this process was fueled with the influx of European émigrés who brought avant-garde art forms to the U.S. Especially in her analysis of Cornell, the author illustrates how this transatlantic transfer stripped these art forms off their European contexts through the appropriation by American artists. This transfer is one of the central subjects in the chapter on Joseph Cornell, where Cran forcefully emphasizes the original status of Cornell’s collage work in relation to his Surrealist influences. Even though strongly influenced by Surrealist collages, especially the work of Max Ernst, Cornell managed to transform this influence into his own iconography. The author elaborates this argument in an enlightening fashion in comparative analyses of selected collage pieces of the two artists, which although composed of similar source materials result in divergent imagery. While Ernst’s collage scenarios tend to be menacing, spectacular, and catastrophic, those of Cornell display a personal mythology, steeped in a sense of nostalgia and childhood memories. So, although there is a traceable influence in the choice of material and technique, Cornell succeeds in creating his own iconography that is contrary to the tenets of the Surrealist agenda. Cran underlines that Cornell created this individual mythology by drawing on New York as his “habitat” and pool of artistic material. The found objects that he encountered on walks through the city and that found their way into his collages and boxed assemblages are, according to Cran, a characteristic of all collage practices in that they reflect the artist’s “intellectual and emotional relationship with a given aesthetic environment.” (4) This aspect is also a leading point of interest in her other case studies. This assessment of the trilogy as a compromise in form and a toned down version of the textual cutups was further underlined by Oliver Harris, who calls the three cut-up novels “aberrations, extraordinary exceptions to the cut-up project rather than its necessary fulfillment.10 Although Harris has somewhat tempered this evaluation in his introductions to the re-editions of the trilogy in 2014 by suggesting we conceive both manifestations of the cut-ups in a complementary relationship, I still want to maintain that there is a higher amount of visible cut in the shorter pieces than in the novel form as they often include layout as an additional spatial element that foregrounds the text’s duality between sign and image. Contrary to these graphically more complex manifestations of the cut-ups, the trilogy offers us the linear time of justified print and discontinuity is mainly visible on the levels of punctuation and grammar. The ephemeral pieces, on the other hand, tell us more about the material nature of the cut-up experiments, as they bear traces of their production processes, and consequently about the theorizations that Burroughs came to build around them. Furthermore, through their complexity, these shorter forms force us as recipients to be more careful in the use of terminology for their description. Cran admits that it is problematic to approach the trilogy as three examples of novels. Instead she suggests to conceive of them “as a series of interrelated pieces of art, consisting of found objects, montages, and simulated and actual collages.” (93) Unfortunately, she neither demonstrates the found objects in the trilogy, nor does she provide a clear distinction between the three latter terms, among which montage has sneaked in like a ghost. So, even although the author has decided to tread in the footsteps of previous studies on the cut-ups that focus on the trilogy, she still manages to say something new about Burroughs’ experiments. fragmentation and a conception of writing as a materially invasive practice. This comparison is productive insofar as it shows a continuity between two supposedly different periods in Burroughs’ oeuvre. This continuity is not only visible in a hands-on attitude to writing, but also in the choice of themes and characters. With much care for detail, Cran illustrates these textual revenants by bringing forward many examples that migrate between various texts. She emphasizes that Burroughs’ adoption and modification of cut-up methods as suggested to him by Brion Gysin allowed him to emancipate himself from Allen Ginsberg’s influence and to reinvent himself as an original artist. By emphasizing the gesture of the cut in its ambivalence of destruction and liberation, Cran indirectly reveals the mechanism by which artistic techniques are theorized by their practitioners through the highlighting of one particular aspect of the montage process. At the latest from this point on, it should become clear how absurd it is to speak of the cut-up as a collage practice. Mimicking Ernst, Burroughs could have equally said, it is not the cut that makes the cut-up. Still Cran’s observation that Burroughs’ self-stylization as a verbal surgeon, or rather Frankenstein of textual body parts, is a pataphysical performance in the tradition of Alfred Jarry – a tightrope walk between art and science. Beginning with the first cut-up publication Minutes to Go (1960), Burroughs parodies the scientific rhetoric of virus research and genetics bound up in the quest for a language of life. He consciously appropriates comments made by scientists and reverses their conceptualization of DNA as a language of life by proposing that language itself is a virus used to program humans. By cutting into this code, Burroughs not only performs an autopsy, but creatively scrambles its meaning. Although Cran evaluates this turn towards science as “serious and humourless” (109), it seems really improbable to miss the irony and slapstick in such texts as for example The Electronic Revolution (1970). chapters on O’Hara and Dylan and find some concluding words by returning to the issue of the composition of the book as a quartet. Even though the author claims to have taken a collagist approach in the structuring of her book, my overall impression is that the interconnections between the four chapters are limited to cursory mentions rather than really evolved narratives. Each chapter stands for itself as an interesting study in its own right, but even though a collage is made up of fragmented composites, they still need to communicate by what Burroughs called “precise intersection points.11 Taking a closer look, one might have found more parallels between the first three artists, while Cornell and Burroughs could have been connected, for example, through a heavy presence of nostalgia in their works and their reliance on the collection and the archive as sources for their artistic practices. O’Hara and Burroughs, on the other hand, could have been related to each other by the common recurrences of Rimbaud in their work, or by comparing Burroughs’ concept of “present time” with O’Hara’s “I do this, I do that” poems, or by their attempts to create subjective maps of their environment in their writing. All in all, Rona Cran presents us with a fresh look at four montage/collage artists even if the glue does not quite stick.